Okay we didn't get to post before October (see post below)! Things have been very busy here over the last month and we're just beginning to see the light at the end of the tunnel that runs through sample mountain. Of course such a large amount of concentrated studio time has left us all pretty much ill and grumpy but pleased with the amount of work we've managed to churn out under some pretty impossible deadlines. 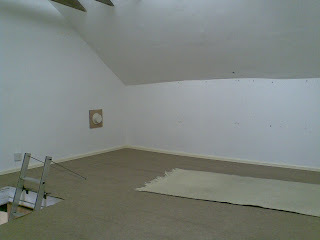 Time also to finally say a proper goodbye to GCHQ or as you can see in the pic (from my camera so sorry about the quality) the loft space above Mr Hoodee (and misses) bed room in their now rented out cottage. We finally had to shift the 2000 or so records that were being stored up there (not fun) and when it was finally clear it looked so cool we just wanted to move it all back in! That loft, boiling in the summer (you can see the hole we knocked through the roof to blast the hot air from our air con) and freezing in the winter was really the place we turned from doing this stuff as a hobby into doing as a job - notice I didn't use the the word 'professionals' there !-) and as such will always be looked back upon fondly. Still, upwards and onwards, GCHQ mk 2 (currently under the working title of 'the beat bunker') continues to grow and due to the current financial climate has become a much more permanent dwelling than we were expecting. Next job is to get a new workspace (Thomann have a cracker on their website) in there, new command chair and sort out our rather overflowing rack space. no doubt some pics and frustrated words about having to rewire everything for the 3rd time in a year will appear up here before Xmas. I will miss the exciting sport of trying not to fall down 'the hatch' while pogoing my way through hot guitar licks.